Admit it… (since we play it honest around here)… There are people you answer immediately when you see their name on the screen. You light up inside when their name, number- and probably even their pic because they are special to you- show up on your phone with a call from them. Then there are others who cause you to pause and really assess if you have the emotional and mental wherewithal to have that conversation at that moment. And you decide in that moment whether you will accept their call or decline it. It’s the reality of life in this modern era. Sometimes we’re busy working on something and feel like we can’t stop for that call right then. Sometimes we’re on a call with someone else, and we don’t want to stop the conversation we’re in at the moment to talk with someone else. We have to make a choice. It’s the reality of our limited human nature. Last night, I sat in as a helper for the kids Bible study at our church. They are currently learning about prayer. Quite honestly, they are learning the basics. But it was good for me to hear the basics again. And one of those basics is that God is always listening. He always “accepts our call.” Every time. Yes, every time. I know it’s kind of difficult for our finite minds with imperfect emotions to believe and accept, but God is always listening. He never turns us away when we come to Him. Some people think that they have been too bad in life and that God would not accept their call. But He does. And He will. If you’ve done wrong and you admit it, He’ll listen. He will answer your call. And He will forgive you. Some people who really are trying to do right in life but don’t get everything perfect have a tough time believing that God would take their call. They think that they probably aren’t on His favorites list. But the truth is, God has more than seven billion people on His favorites list right now… every person alive on this planet. When you call Him, He not only has your name and number saved, but He lights up when He sees your face on the screen of prayer. God delights in taking your call. He wants to talk with you. You’re never a burden to Him. You never bore Him, no matter how mundane you think the conversation is from your side of things. He loves every call, every conversation with you. So He never hits decline. He never lets you ring through to voicemail where He listen at the time of His choosing. His time of choosing to listen is now… in a live, one-on-one conversation with you. What is mind-boggling to me is that God is the ultimate multi-tasker. He never has to put you on hold to answer my call and talk with me. He never has to stop making the earth orbit the sun to take your call. He doesn’t have to stop working a miracle on the other side of the globe for me to talk with Him about what’s going on in my life. Mind officially blown. There are times when I am so busy working on something that I won’t even pick the phone up to see who’s calling. There are other times that I’m busy with family and I look to see who’s calling but don’t answer because I choose my family over that person at the moment. But God never has to choose between. He takes the sinner’s call for love and mercy while taking the saint’s call for provision. He takes the child’s prayer for a puppy while simultaneously taking the driver’s emergency call for protection when it looks like they are about to wreck. There is never a moment when God has too much to do to take your call. Regardless of how big or small the request may seem to you or others, it’s important to Him. Psalm 37 points out to us that He delights in every detail of our lives. In other words, He likes taking our calls. Have you ever called someone, and they hit accept but say nothing initially? Maybe they were talking to someone else and were finishing up the conversation before they answered you, but didn’t want to miss your call. Maybe they were ordering food at Chik-Fil-A, answered your call but muted their voice till they finished ordering and could talk. Or maybe they said “Hello” before the call actually connected fully and are waiting on you to say something. So you end up saying “Hello?” like four times before they respond. Well, God never declines our calls. And God is never too busy to take our calls. But sometimes, we feel like God is declining our calls, or at least not answering right away when he picks up. Our tendency is to think that He is like us… that He must have His hands full or just isn’t interested at the moment. But nothing could be further from the truth. 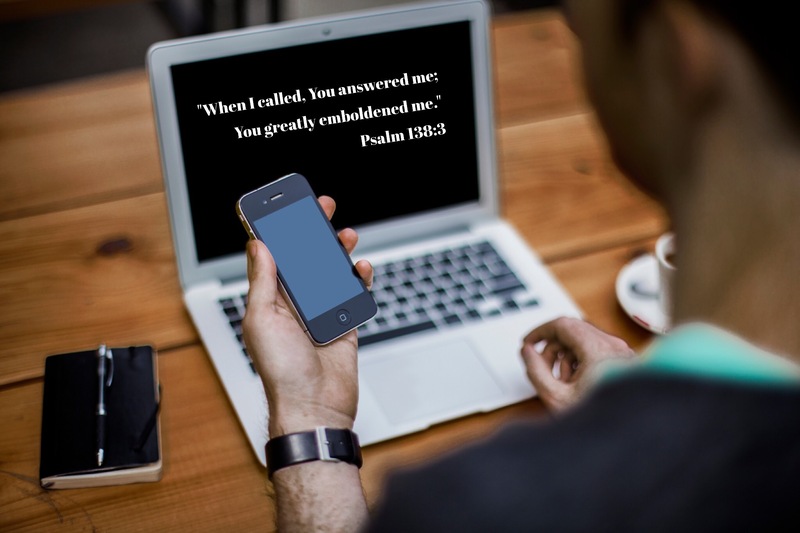 Psalm 138:3 points out that when we call, God answers. Every time. Once a guy in the Bible named Daniel… yes, that Daniel of the den of lions fame… prayed to God. And it seemed like God wasn’t answering. Daniel didn’t lose faith in God. He kept on praying every day about the issue. One day, after 3 weeks, an angel appeared to Daniel and told him that God heard Daniel’s prayer the first day he called out to God. And God dispensed that angel immediately to come help Daniel. But the devil’s forces tried to interfere with the angel God sent and prevented the angel from arriving that first day. You see, God answers every call immediately. We may not hear the response at that moment, but we can be sure in our hearts and minds that God answers our call, hears us and responds immediately. So, if you’ve been calling God for awhile in prayer and haven’t heard a response yet, please don’t give up. He’s not ignoring your call. He’s not too busy. Choose today to believe that God loves you, God hears you and God will respond to you. Next Post: Curiosity or Care?